We offer screen printed, sublimated, or engraved discs with many different medallion and ribbon styles to choose from. Choose from any color disc and have us make custom graphics to fit your specifications. You can also get medallion holders for display purposes. 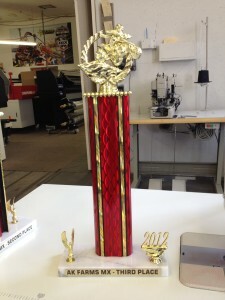 We offer unlimited styles of trophies. The main categories are pole, cup, and specialty awards. Pole trophies range from simple one pole to giant four pol four tier trophies with many different styles and pole colors available. For cup trophies, we offer a variety of bases and cups. Specialty awards include eagles, glass plaques with a stand, plaques with photo holders, vases and glass sculptures, acrylic pieces, clocks, and many more. Big or little, we make anything to fit your budget.